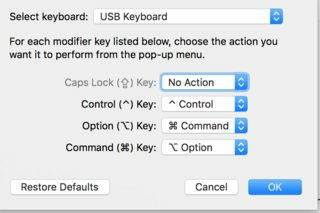 The external keyboard configuration from Preferences|Keyboard|Modifier Keys is not working properly on my Sierra mac. It works fine for the same and other external/USB keyboards on my two El Capitan machines. The following http://rainer.4950.net/2009/09/30/resetting-the-usb-keyboard-type-on-mac-osx/ recommends to disconnect the external keyboard and then delete /Library/Preferences/com.apple.keyboardtype.plist. The end goal is for the following to actually work properly: i.e. disabling caps-lock and swapping option and command. Instead those customized settings are presently ignored and only the default mappings are actually enabled. Browse other questions tagged keyboard sierra system-prefs . How to set different rules for different keyboards in Karabiner Element? 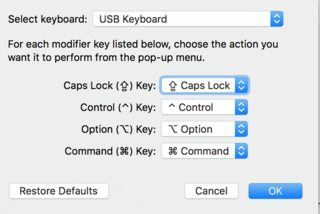 Why doesn't the disabling of the Caps Lock key have any effect?